The great moment had come. We would try to hike to the top of Mount Williamson. I had reserved four permits for Sheperd’s Pass months in advance, but a couple days before departure, two participants decided not to come and so only Richard and I remained to form the “summit party”. Williamson, the second highest peak in California (after Whitney) and the fifth-highest in the contiguous United States, is a longer climb than Whitney and we never even contemplated doing it as a day hike, even though an overnight trip would require us to carry a ton of gear for 12 miles and 6000 feet up the mountain. Now, in retrospect, and after I have day hiked Tyndall, I wonder if that would have been possible with just 5 pounds instead of 35 pounds on one’s back. However, I do not plan to go back to test this hypothesis--too many other mountains to climb. Rich and I left Davis on Friday July 1st at around 4 o’clock and drove through Yosemite on our way to the east side of the Sierra. Highway 120 had just opened 8 days earlier and we stopped a couple of times along the road to take nice shots of the snow-covered high sierra in the park. 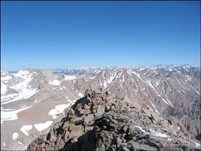 Williamson can only be climbed officially from December 15th to July 15th, because it lies in the Bighorn Biological Preserve and is closed throughout the rest of the year. We therefore had to climb it so early in the season, even though that probably implied a fair amount of crampon use. Upon hitting CA-395 we turned north to go to Lee Vining for dinner (I cannot really recommend any place in town with conviction) before we headed south again to reach Bishop and the Motel-8 where I had made a reservation. The next morning we left Bishop early, because we still about an hour to drive before getting to the trailhead. To reach the trailhead, we turned right in Independence onto Market Street, which we followed for 4.5 miles before turning left on Foothill Road. Then we followed the signs leading to Symmes Creek (or Shepherd’s Pass) for 4.4 miles before arriving at the trailhead. At the trailhead we met a younger woman, who was camping next to her car. We apologized for waking her up, when we rolled in at 6am. She told us that she had driven up the night before and was waiting for her climbing buddy. The encounter was interesting, because more than 36 hours later, when we came down from the mountain, she was still waiting, pretty much in the same position (sleeping next to her car) although she claimed to have been up to Anvil Camp and back in the mean time. After packing our bags, we got going at around 6:15 in the morning. We followed the Symmes Creek for about a mile, crossing it four times along the way. It was relatively early in the season and the water level was pretty high. I managed to jump from rock to rock, but with the heavy bag on my shoulders that was an uncomfortable undertaking. Richard took of his shoes once and waded through the stream, definitely the smarter choice. Interestingly, just 36 hours later, on our way back, the water level was noticeably higher, indicating that the snow higher up was now melting at rapid rate. After one mile the path no longer followed Symmes Creek along a gradual incline. Instead the trail turned south and began a very steep switchbacked ascent to Symmes saddle. Luckily, it was still early and the sun had not risen over the mountains yet (although most of this part of the hike was shaded by trees) and we reached the saddle after about 2.5 hours after having only stopped briefly for breakfast. From here we could see Williamson for the first time (but we did not know this at the time). The GPS already showed an elevation of about 9,000 feet and I was happy about the gain, but dreaded the upcoming descent by about 1,000 feet. Somebody had written on SummitPost that whoever built this trail must have been “on crack”, because of its steepness in certain parts and then incline of just a few feet over half a mile. And then there is this drop in elevation, which turned out to amount to just 600 feet instead of 1,000 feet. A place where many people camp the first night is Mahogany flat, which is located at around 8,500 feet and a good source for water. We had relatively little water left, but I convinced Rich to keep on going, because Shepherd’s creek is not right next to the trail. I thought that we can easily reach Anvil Camp at 10,000 feet, before taking a longer water break. From the creek at Mahogany Camp the trail rises back into the mountains on a number of very long and relatively flat switchbacks. This was very frustrating, because we could see Anvil Camp and whenever we came close to the camp another switchback would lead 500 yards or so away from it again. In addition, we were running out of water and the sun was shining mercilessly on us. We were ready for a break. Eventually we reached Anvil Camp (after 5 hours of hiking) and rested for a good half an hour. What a great feeling when we could put the backpack onto our wet backs again. We crossed Shepherd’s creek and lost the trail pretty soon thereafter, because we encountered a fair amount of snow. We headed straight uphill through a maze of small fir trees, before finding the trail again after about 300 yards. Most of the following mile was snow free, although we kept crossing a number of snow patches along the way. We encountered real snow when we got to the bottom of what later in the summer would be the switchbacks leading up to Shepherd’s Pass. No switchbacks were visible, however, and therefore we put on the crampons and headed straight up the snow. This was fairly straightforward and at about 1:30pm, or 7:15 hours after we set out we reached the top of Shepherd’s Pass, our destination for the first day. We saw a few tents near Shepherd’s Pass and the lake close to it, but I suggested that we move up higher a little bit since it was still early and we would get closer to our goal. After a break we moved up higher and found a nice spot to camp near the base of Mount Tyndall’s north rib. There were still snow fields all over this plateau-like landscape and we managed to camp next to an area with a number of water filled potholes (where the water was constantly moving from the snow melt higher on the mountain). We set up camp and I passed out in the tent, while Rich filled up the water bottles. For some reason, my right hip was hurting pretty badly and it felt good to get some rest. I assume it was the strap of my backpack that kept pushing onto a muscle or tendon of my hip. But it soon became very warm in the tent – it was only 3 o’clock in the afternoon – and I set out to explore the area a little bit. Without the backpack I was not having any problems walking and I therefore headed up to the beginning of the Williamson Bowl and then climbed a smaller unnamed peak (which I call peak 12,950, because that is its approximate elevation), while it was Richard’s turn to take a nap. The views of the Sequoia National Park to the west were quite spectacular. The valley leading to the Kern River and the Central Divide (Milestone Mountain, Thunder, etc…) contained still quite a bit of snow, and thought that this might be a convenient spot to cross the Sierra Nevada in the winter, because it is fairly flat high country and one does not run the risk of encountering avalanches. For dinner we brewed up a couple of instant soups and ate some of the trail mix that Richard had brought along. Soon thereafter – basically when the sun had disappeared – it became too cold to sit outside and we crawled into the sleeping bags. We had not set up the tent in a well-protected spot, but luckily there was not much wind during the night and I slept maybe 7 out of the 8 hours I spent in the sleeping bag. Even Richard (who was not the keen on spending the night in the tent at this altitude) thought the next morning that he had slept an hour or two. We were up by 5am and ready to go fifteen minutes later. The reason for such quick movements in the morning was mainly the cold. Coming out of the sleeping bags even with a cup of hot oatmeal in one’s hand and multiple layers of clothing, it feels very cold and the only way to stay warm was to keep moving. Since I had explored the area a little bit on the day before, it was able to find the use trail again that led up to the beginning of the Williamson Bowl. One basically has to aim at the lowest crossing point of the crest. I also found the sign again that indicated the closed season of this part of the mountain, which would begin 10 days later. The sun was up by now and there was no need to use the headlamps anymore. Crossing the bowl was a tough adventure, because of the constant up and down. At sea level this would not be a problem but at over 12,000 feet, it was quite frustrating to arrive at the top of a ridge just to find out that one had to descent 200 feet before ascending another 250 feet to the next ridge. However, at around 7:30 or so we had crossed the Bowl and arrived at the “Black Stain”, which marked the entrance to the class 3 chute leading up Williamson’s west face and supposedly the easiest way up the mountain. We were at first not sure which way to go up but soon found tracks from hikers who had come down late the previous day (Wingding was one of them, we had met her at around 8pm the previous night, close to our camp). Before actually entering the chute we climbed up a couple hundred feet on relatively loose class 3 talus, which was quite strenuous. Luckily, it soon became necessary to put on the crampons and we were then able to quite easily hike straight up the snow chute instead of losing our footing on the loose talus or having to switchback up the talus. The term easy, of course, is used in a very relative sense. At this altitude I reverted back to my usual 50 steps, 1 minute pause routine. I climbed a little ahead of Richard and whenever I turned around he was leaning bent forward on his ice axe, and I am sure he kept the same image of me in his mind. Naturally, my 50steps-1minute routine turned into something like 10 steps-5 minute break routine until finally after 90 minutes in the chute we reached the end of it. However, where to go next? There appeared to be no way out. I verged a little bit to the left to an opening in the wall in front of us, but only saw a steep drop down the east side of the mountain. That was definitely not the way to go. We read the description again and I remembered that we had to be looking for a class 4 chute leading up to the summit plateau. We saw it immediately thereafter and 5 minutes and 40 vertical feet later we were on the summit plateau. From here it was just a short climb up to the actual high point of the second highest mountain in the state, where we arrived at around 8:30. The views were spectacular: Tyndall, the Williamson Bowl, Whitney, Russel1 and Langley, Barnard, Junction and an overall panoramic view. We were the first ones on the mountain and only encountered two more parties (one single hiker, Eric from SummitPost, I would meet him again five weeks later for the Sierra Challenge) on the way back to our tent. The whole way back I contemplated the idea of climbing Tyndall as well, but I did not need much convincing from Richard that if were to be back at a reasonable hour in Davis, we should hike straight down. That was just fine with me. What was remarkable on the way down? We packed up our stuff, glissaded down Shepherd’s Pass and then hiked with few stops back to the trailhead. The ascent from Mahogany Camp up to the Symmes Crest was tough. We arrived at the trailhead at around 7:30 with some daylight to spare. Our LA friend was still in her sleeping bag next to her car, we grabbed burgers at MickyD’s in Bishop and arrived back in Davis at 3 in the morning after sharing driving duties. All in all a great trip.